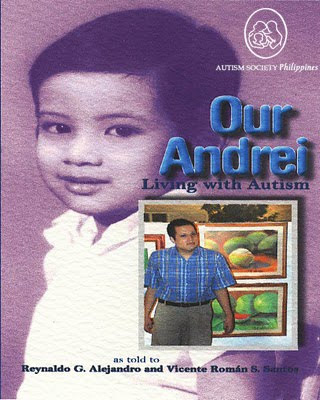 A first of it kind in the Philippines, a biographical book about a familiy’s stru ggle with autism. Be moved by a Filipino family’s difficulties and successes in addressing autism in one of its members. Learn about autism, its symptoms and methods managing it. Discover how consciousness about autism in the Philippines grew from the 1960s, when it was hardly known, up to the present. Our Andrei: Living with Autism is a poignant story of the Macapagal Family’s struggle with autism, at a time when it was little known in the country. Without their devotion to Andrei, one of the earliest known cases of Autism, this story would have been a tragedy. But the Macapagals cleared the hurdles, driven by a resolve to break some of the walls that isolated Andrei from the world. In the end, it was Andrei who unwittingly humanized his parents and siblings, even as they helped him. Some of the people involved in the production of this book were moved to tears as they read through the drafts. It was not the painful episodes that caused this. Rather, it was how the family’s profound love translated into action and made better human beings out of each one of them. Ronnie (the late Reynaldo G. Alejandro) and I are not the authors of this book, for we neither created the characters nor formed its plot. We merely told the story that the Macapagal have been living out. It is they who authored the book from which we may now draw inspiration.